J. Hillis Miller is Distinguished Professor Emeritus of Comparative Literature and English at the University of California, Irvine, and the author of more than thirty books on various topics in literature and literary theory, including most recently, An Innocent Abroad and Thinking Literature Across Continents (with Ranjan Ghosh). David Jonathan Y. Bayot is Associate Professor of Literature at De La Salle University in Manila, Philippines. He is general editor of the Critics in Conversation series, and the Critical Voices series, published in association with Sussex Academic Press. 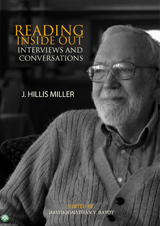 This volume collects 11 previously published interviews with J. Hillis Miller from 1987 to 2015 by scholars and critics from China, the UK, and the US. They address his life and the development of his thought on literature, literary and cultural studies, and reading, including critical theory, ethics and literature, pedagogy, deconstruction, globalization, various writers, his works, and other topics.